CHICAGO – Who cares? Rarely has a movie been so weighed down with horrendous, expository dialogue that has no weight whatsoever as in the widely-loathed “Atlas Shrugged, Part I.” After the notoriously-reviled theatrical release ($4.6 million total domestic box office on a 12% on Rotten Tomatoes) killed the chance at a trilogy (on top of the hysterical Blu-ray labeling error), I kind of hoped the film would either surprise me with its quality or be so awful that it approached “The Room” or “Troll 2” levels of enjoyment. Nope. It’s just boring, boring, boring — the kind of film only worthwhile if you’re having trouble sleeping. The dialogue in “Atlas Shrugged” is so stilted and awkwardly written than were times when I wondered if the screenwriters weren’t going for Lynchian levels of unusual behavior. Characters in David Lynch movies often speak in riddles and with unique patterns, but if that’s the intention here, it’s wildly off the mark. Where Lynch creates style, director Paul Johannson creates nothing but confusion. This movie is a MESS. And every time it starts to make a bit of sense, the dialogue is so noxious that one begins to doze off and loses what little connection to the plot they may have had. Perhaps you think I exaggerate. Nearly every scene in “Atlas Shrugged” starts with the character saying their name and what they’re there for. It not only violates the classic rule of “show, don’t tell” when it comes to screenwriting, it proves it by doing the extreme opposite. Fans of the book and serious film buffs will cringe at the dialogue but even people unaccustomed to noticing things like awkward conversations will be aware that something is seriously wrong here. It doesn’t sound natural. It’s not interesting. It’s just awful. Why talk about it any more? Brief Final Note (because it’s the most notable thing about the release): If you’re wondering about the aforementioned labeling error, the back of the first printing of “Atlas Shrugged, Part I” opens with “Ayn Rand’s timeless novel of courage and self-sacrifice…” Anyone who has read the book or seen the film will know that the story is about the OPPOSITE of self-sacrifice. It’s about the individual. As you read this, Fox is recalling thousands of DVDs and Blu-rays to change the wording to “self-interest” instead. Perhaps those who work for the company writing copy should actually watch the movies they’re helping produce. But I can’t really blame them in this case. Ayn Rand’s timeless novel of courage and self-INTEREST comes to life for a new millennium. The year is 2016, and America is on the verge of economic disaster. The greatest citizens are being targeted, and dark forces are working to bring about America’s final days. Our only hope for salvation lies with Dagny Taggart and Henry Rearden, rugged individualists whose bold ideas may have the power to spark a revolution and reclaim to the American Dream. “Atlas Shrugged, Part I” stars Taylor Schilling, Geoff Pierson, Edi Gathegi, Paul Johansson, Armin Shimerman, Patrick Fischler, and Matthew Marsden. It was writen by John Aglialoro & Brian Patrick O’Toole and directed by Johansson. It was rleased on Blu-ray and DVD on November 1st, 2011. Submitted by Jeff Williams (not verified) on November 28, 2011 - 11:26am. Is this the best acted, most amazing film ever made? No. But the story and its’ underlying principles are critically important - it’s not surprising that this reviewer can’t grasp them. I thought the movie was well done, and I am VERY hopeful that the filmakers will continue and produce the remaining two movies. This time, however, skip the leftist entertainment institutions full of useful idiots and proceed straight to what is left of our free market and head straight for video and digital distribution. 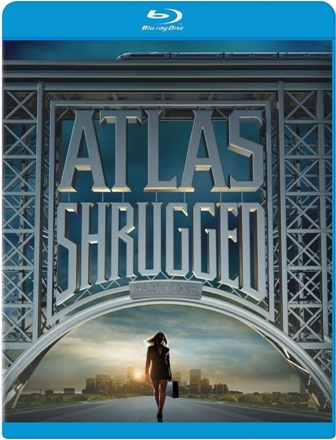 The message of “Atlas Shrugged” is timeless, we can either learn from it, or eventually, ultimately crumble as the dystopian society in this film is.